Leonard Nimoy, who played the Vulcan Spock in the "Star Trek" franchise, died in February 2015 at the age of 83. The son of Leonard Nimoy is planning a new documentary film that would chronicle the evolution of Spock, the "Star Trek" character his late father made famous. Adam Nimoy has launched a Kickstarter campaign to fund the project, which would also include biographical information about his father, who died in February at the age of 83. The effort needs to raise $600,000 by July 1 to receive funding. As of today (June 4), it had garnered about $81,500. "I had skimmed through some of the books on the making of 'Star Trek' and felt there was so much more to explore about the birth and evolution of Spock," he wrote on the project's Kickstarter page. "And the timing seemed right, as the 50th anniversary of 'Star Trek: The Original Series' [the TV show that ran from 1966 to 1969] was not that far away," Adam Nimoy added. "Dad agreed that now was the right time, and that he was 100 percent committed to collaborating with me on this project." The production company is 455 Films, which Leonard Nimoy chose because it has created "Star Trek"-related films with William Shatner, who played Captain James T. Kirk. "The funding of this film through Kickstarter will enable us to continue with production — which will mostly take the form of filming interviews of Dad's friends, colleagues and family members," Adam Nimoy wrote. Money will also go toward editing, selecting a composer and licensing 50 years' worth of film clips and still photographs of Spock and Nimoy. The project should therefore bring to light some "Star Trek" artifacts that haven't been seen in decades, Adam Nimoy wrote. If funded, the film is expected to premiere sometime in 2016. 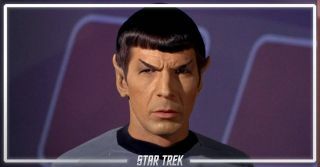 Spock was beloved by "Star Trek " fans for his logical thinking — a trait of Vulcans — as well as the occasional emotional quirk, which came from his human mother. Spock was one of two trusted advisers of Captain Kirk and the foil to the other adviser, the highly emotional Dr. Leonard "Bones" McCoy.